For our class schedule and to register for classes, go to our Class Registration page. We offer classes for children as young as 7. Teens and adults are combined for classes but people will be split during class based on ability. We are looking to offer classes for even younger children in the future. 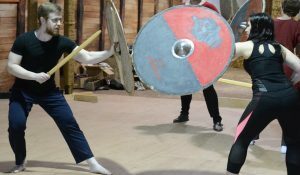 We offer public workshops & seminars on Viking martial arts, Viking culture and Viking Age crafting. The workshops are fairly short (50 minutes to 4 hours) and are designed to be introductions to the various topics. They are fun events that are perfect for an evening out with friends or a great date with that special someone. 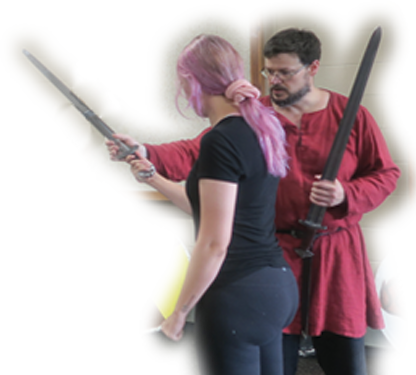 For the Viking martial art intro workshops we play Viking games, introduce a lot of material in a short amount of time and have you sparring by the end of the workshop. The purpose of the public workshops are not to get everything right and we generally don’t have the time to make sure everyone’s form and technique is perfect. If you want to focus on building your skills and are more serious about your dedication to the martial art or a craft, our regular classes are a better fit. 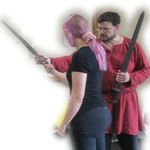 Our regular classes are for those who are more serious about becoming skilled at Viking combat. This doesn’t mean you need to be a die-hard and spend every waking moment training. Even if you are more casual about the pursuit but want to hone your skills, these are the classes to attend. However, our regular classes and memberships are not immediately available to the public. You must have earned the rank of Karl before you can get a Viking Martial Arts Membership and take these classes. To earn the rank of Karl you need to go through our Beginner's Karl Program. We also offer classes and practice sessions for throwing weapons: axes, spears, javelins and seaxes. These classes have their own membership option for those who are primarily interested in throwing things. We have Open Gym once per week for both Viking Martial Arts and Throwing. These are two hour sessions where you can come in and practice, play Viking games and more. Our clinics are 30 minute instructor lead drill sessions. Open Gym and Clinics are free with a standard membership. We offer private instruction. This can be for an individual (so 1-on-1 training) or you can invite up to 4 family members / friends to make it Private Group Instruction. We also offer birthday parties, other types of parties and corporate events. Contact us to learn more.